Baking is a really popular activity for most toddlers & young children and Caterpillar certainly loves it. We usually bake from scratch but if I’m just doing it as an activity to keep him entertained, rather than because we have a get together to bake for, we sometimes use a store-bought, packet mix for ease. Typically, I find the results you get from these to be pretty awful and I do wonder what’s in the ingredients which is why I was really intrigued to find these nutritious packet mixes from Sweetpea Pantry. 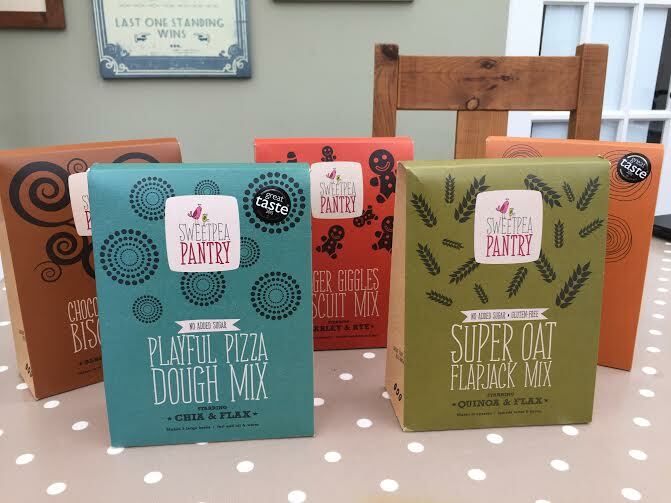 Many of the mixes are gluten-free and they all contain whole grains and no refined sugar. I’ll confess, I’m not exactly a healthfood enthusiast so I’m unlikely to make from scratch with flax seed or cacao, so to know that these kits contain all kinds of goodies like that has me polishing my Good Enough Mummy halo a little. So what are they like? All you need to add to this recipe is melted butter (or coconut oil) and honey. The dry mix looked great, packed to the brim with different grains. Fun and easy for Caterpillar to help with, he loved getting stuck in pushing the mix into the tray. Once cooked the consistency was a little too crumbly however the taste was really great and they were very filling. Making pizza is one of Caterpillar’s favourite things to do in the kitchen and, weirdly, I find it’s a good way of getting extra veggies into him as he tends to eat peppers and sweetcorn by the handful when we’re putting toppings on (which isn’t always the case when they appear in his meals!). All you need for this dough base is water and oil, and then of course your pizza toppings. The dough proved really well and got nice and light. Caterpillar loved kneading and rolling out the dough. This was probably my personal favourite of the items we tried, the cooked pizza was delicious (although note that I did have to cook it a little longer than stated on the packet). I’ve never baked with cacoa before and was concerned that it wouldn’t provide enough chocolatey-ness and sweetness but these were actually really yummy. I love dark chocolate and they definitely reminded me of the really strong kind. Slightly more effort required in the making of these but barely (okay, I had to whisk an egg white – can’t really complain about that). Again, Caterpillar loved getting involved, especially in cutting out the biscuits (butterfly shaped – what else?). Plus, I couldn’t believe how many biscuits you could get out of this one packet. The box says 24-30 but we had over 40, and a decent thickness too. We cheated on the healthiness a little by adding some icing and chocolate drops. 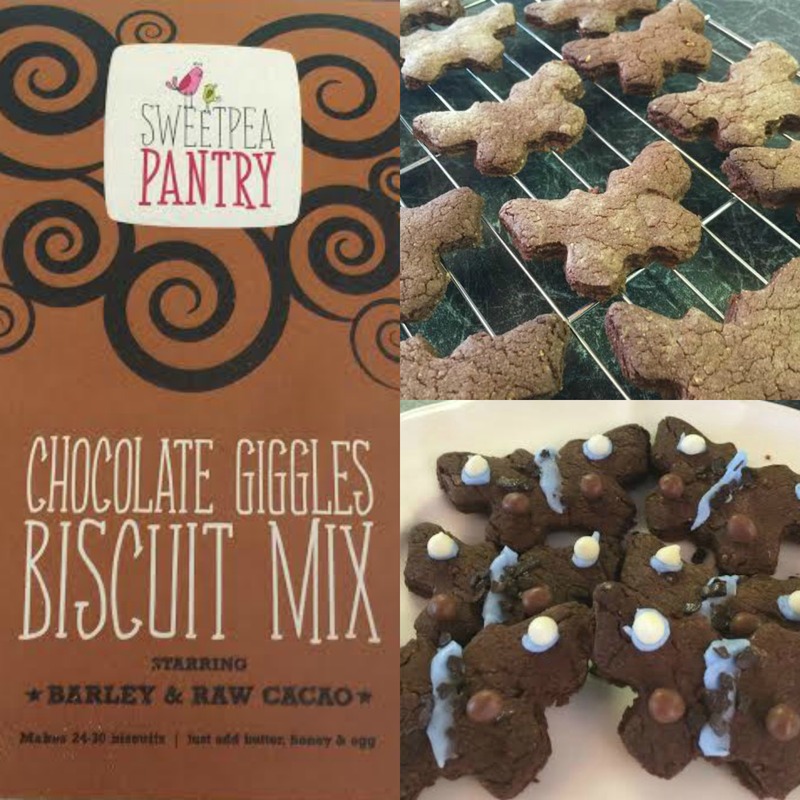 Overall, I was really impressed with the quality of these Sweetpea Pantry packs. They are priced at £4.99 each which isn’t too bad when you consider how much you get out of them. We got three large pizza bases and well over the amount of biscuits and flapjacks stated on the packet. Sweetpea Pantry are available at M&S, Ocado or you can buy direct online from www.sweetpeapantry.co.uk. 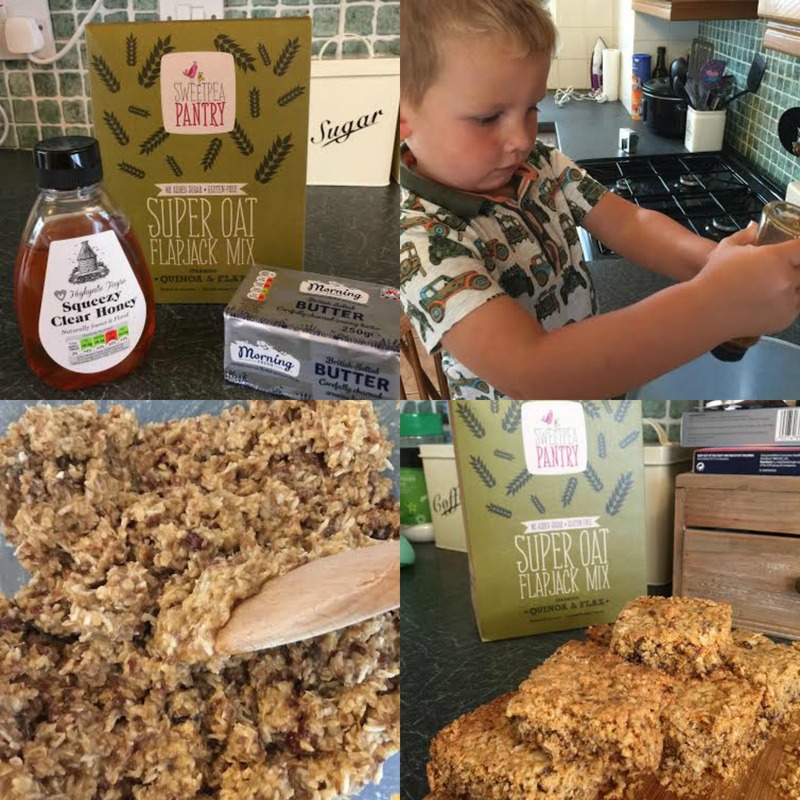 Or you can enter the giveaway below because I have two mixes to give away to one lucky reader – Grainy Brainy Pancake Mix & Ginger Giggles Biscuit Mix. I love these sets, my daughter and her friends find them so easy to follow. brilliant mixes, and we all LOVE ginger here! Would love to try these mixes. They look great. These look great and would encourage me to bake more. These look fantastic! I would love to try! Thank you so much for this YUMMY giveaway!! Look very nice to eat. These look yummy. My daughter would love making these. These all sound lovely and like a real treat as well as an opportunity to try something different. These would be a great storecupboard stand-by but also a good way to try new ingredients without having to buy large quantities I wouldn’t maybe use up. 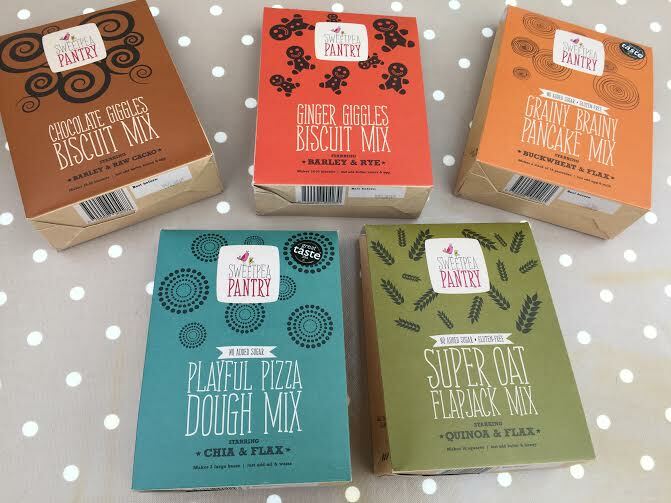 Fantastic mixes – they look great! I love baking, especially with the kids. These look great packs. Never seen them before. My niece would love baking these with me! 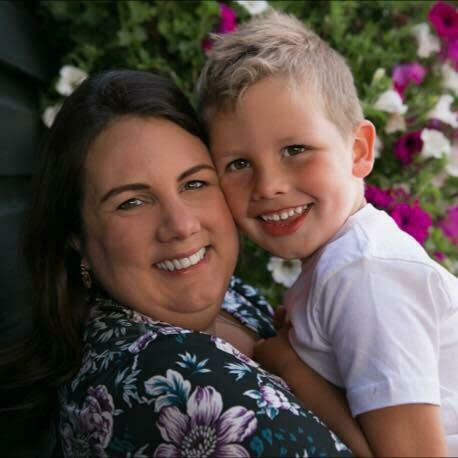 I love baking with my grandchildren so would love to win. Great selection of baking goodies. These look like great fun! I find raw cacao does taste a little different to standard cocoa, but it’s no hardship trying both out! Love selection. I never actually came accross this brand before.